I think destroying robots is acceptable no matter what their level of sentience is... or at least that's how it seems in most fictional universes. How many robot funerals have you seen? 😛 The Autobots kinda get funerals when their sparks are extinguished, but that's the only example I can think of. In the 1990s, there was a Batman action figure. It was about 16 inches tall. I think it was called: "The Ultimate Batman". It was a typical black + gray suited batman. in one hand, he had what looked like a sawed-off, double barreled shotgun. maybe secretly, maybe batman takes a scatter-gun to his enemies, if their karate is better than his! The sawed-off gun, was the action figure's only weapon, too. 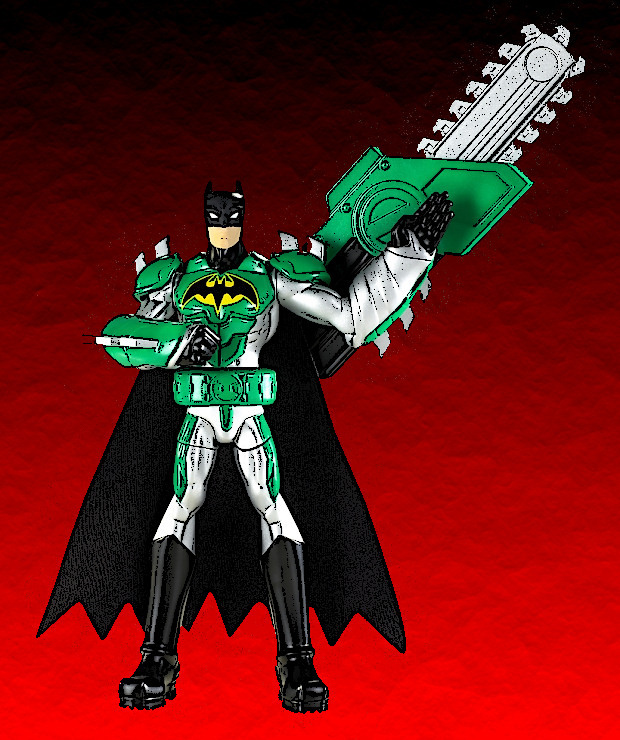 Amazon calls it: the "Ultimate Batman 15in Electronic Action Figure". The description on the box, lists the gun-thing, as a "Double Barrel Assault weapon". So, oops, my calling it "a gun" might not be accurate. But the toy's box doesn't explain what kind of "weapon" it is. Does it shoot bullets, or not? who knows. Is it a firearm? I think the weapon matches the blue of batman's uniform. On the photo, on the back of the box, there is a bleached out/white shape, which is the weapon. I think a bad photo made this gray gun look white. The weapon looks like it is about as long as batman's forearm + hand. The weapon looks, in shape, like: a pistol-grip shotgun, with an eagle-shape lying on the top back half of the gun. I think that this figure is from the 1992-era TV show: Batman: The Animated Series. The first year of the Batman comic books, was May of 1939 to May of 1940, I think. Maybe the writers of Batman had batman go no-guns-only, in order to make the fights harder on Batman. I think that when Batman has to fight harder, his stories are more interesting. You might be right about the reasons the writers instituted the no gun policy -- I'm thinking it probably had quite a bit to do with the Comics Code Authority, too.